What do missionaries in Peru have to say about what God is doing there? You can find out first hand right here! The oldest blog out of Peru that I'm following right now is called The Poes in Peru!. Blogging since 2005, John and Debbie and their family are "Taking the Water of Life to the Deserts of Peru", church planting in Lima. You can get an overview of their ministry here. If you're looking for someone who posts a little more often, you can stay in Lima and visit The Thompsons. Lots of great pictures of life in Peru! Head inland to visit By Grace Alone. Tyler and Brenda have a beautiful blog again with great pictures of another part of the country. Go south and you'll find To the ends of the earth...Perú. Currently one of our newer missionaries in Peru blogs, started in 2010, with posts full of stories, pictures, and videos of life out of the city. The Church has been growing in Peru - praise the Lord for the believers and missionaries in Peru! But there is still a lot to be done. Many groups are still isolated from the Gospel - some without even a full Bible in their language. There's the challenge of people groups that need to hear, and the many groups that are pouring into the cities as well. 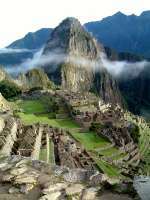 One challenge is the Quechua peoples, with their dialects which are among the most difficult for an outsider to learn. Peru was home to the Norte Chico civilization, believed to be one of the oldest to thrive in the Americas. The currency of Peru is the Nuevo SolA popular dish in Peru is the Anticuchos, grilled, skewered meat. Most often the meat is cow heart. Don't miss the thoughtful posts from jeffkrohn's Xanga Site, or these missionaries in Peru working with University students, and the adventures of 12 Degrees South! And don't forget to pray for these missionaries to Peru!